Keep up to date with everything going on at ISE 2016! Panasonic Live @ ISE offers you the chance to see the very latest ground-breaking Panasonic Visual Solutions from the comfort of your own laptop. Here’s a sneak peak of what we’ve got in stall. 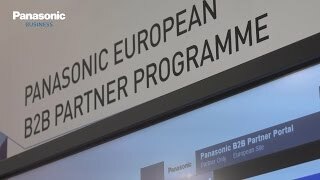 Don’t forget if you are coming to ISE this week to drop by the Panasonic booth H20 right in the middle of Hall 1. And join us again at 1pm CET. 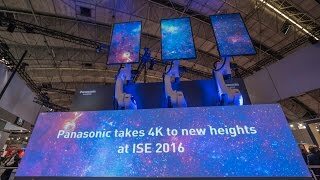 Remember the projection mapped Tesla from last year, well we’ve gone one better this year, we’ll be unveiling the showstopper next on Panasonic Live @ISE. 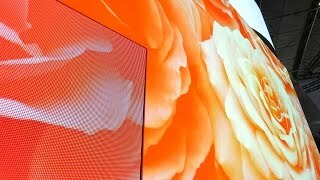 Live@ISE2016 | NEW PERSPECTIVES. NEW POSSIBILITIES. 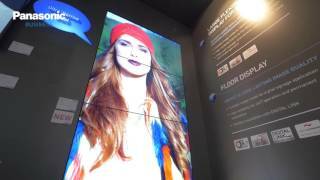 Witness the laser revolution and the way forward in open system for content management We are going bigger and better at ISE 2016 with our biggest ever booth and more visual applications on show than ever before. The main highlight this year sees Panasonic demonstrate its leading position in laser projection and preview a complete range of lamp-free technology from 5000 to 28 000 lumens, designed for the most unforgettable events. 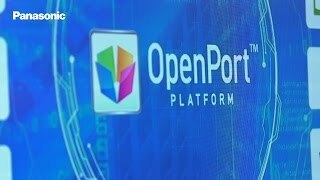 For professional displays, Panasonic is using ISE to introduce its new System on Chip solution, the Openport PLATFORM™. Based on standard Android architecture, it enables any third party software, especially Content Management Systems to be installed without any specific development. 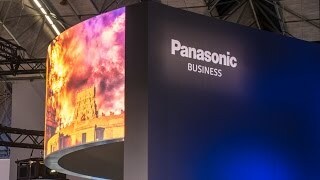 Panasonic is also exhibiting its end-to-end line up of displays and projectors along with professional video cameras and AV software products. These industry leading products are all combined, bringing to life real-world applications such as rental and staging events, 3D video mapping, public displays, and corporate and education settings. 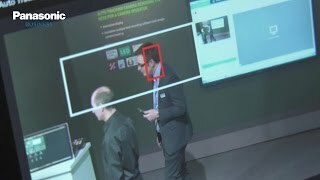 Panasonic is providing its own app server with Panasonic tested and approved signage apps and currently several Signage software vendors are already certified. The AF1 series are high quality displays, available in 42”, 49”, and 55” panels, and make sure that everything that you need to operate them is already included. We’ve got a curved screen on which we’re delivering edge blended content from four 4K Panasonic projectors. The demonstration is designed, sequenced and controlled through d3 on a 4×4 pro media server, which can output a 16K canvas in a variety of video signals. On the booth we have our 4K Live production system, which includes 3 of our remote cameras. We’ve also brought along a 4K monitor, controllers and switchers too. Jan Markus Jahn tells Panasonic Live@ISE2016 about his thoughts on the show so far, how laser projection is changing the industry and the challenges that the industry faces in the years to come. Adding motion to stage design and scenery creation is the next big trend. Bon Jovi have taken robot screens on their The Circle World Tour to create a metamorphic stage, Royal Caribbean Cruise Lines have built a stunning theatrical show around moving screens and projection installed by Amptown systems into two of its latest cruise ships. Now Panasonic is showing a stunning setup incl. 4K screens and 3-Chip DLP projectors. The set includes three TH-98LQ70 which are robust enough to cope with the robots movement thanks to their aluminium back frame design. DS12K projectors integrated into the stage floor illuminate the stage backdrop, without casting shadows thanks to the LE90 ultra short throw lens technology. Robot applications, like this are becoming more accessible for every event, thanks to companies like XPION and its RobEX package. There’s been a huge trend in the education sector towards using video to support student learning. Because of the enormous growth in mobile devices, there’s an ever-greater need for universities and colleges to offer learning resources that students can access whenever, wherever – whatever device they’re using. 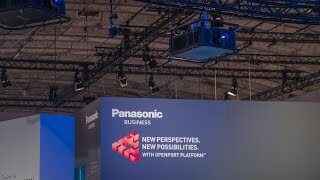 Visitors to the Panasonic booth will see how lecture capture and video management systems are used in conjunction with a Panasonic professional displays, projectors and remote cameras. This is the first Panasonic supported 100% operator free lecture capture system, because of the auto-tracking camera. This kind of combination of hardware and software is critical in creating a positive user experience. 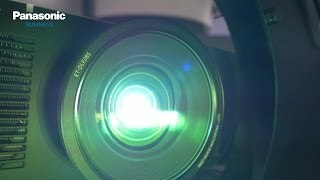 Panasonic laser projectors are perfect for higher education. Projectors tend to be in use across the day and there is no maintenance requirement, so you’re not going to lose projection in the middle of an important lecture. Projection has a great future in retail, it’s now possible to run a projector all day every day for seven years without exchanging lamps or cleaning filters, so projection is becoming as cost effective and reliable as other visual displays. 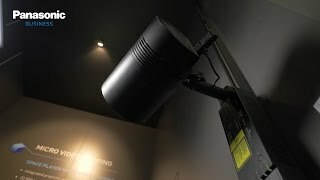 Light ID’s a technology developed by Panasonic which allows to transmit data through the modulation of the light emitted by, virtually any illuminated device. The easiest way to describe it is that Light IDs are like barcodes or QR codes written in light. We think the RZ31K will be the new working horse of the rental industry. It will provide a better cost structure and performance to live events. The maintenance free concept optimizes the service processes before and after a job, the robustness of the projector reduces the need for redundancy leading to less kit to be deployed and the rich colour and stable brightness of the laser renders a better picture quality. This is sure to go down well with event production teams, as projections stacks will become smaller and less complicated than in the past, saving time and money. 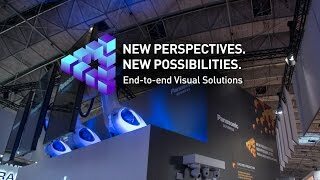 We are combining Panasonic’s industry leading projectors and some industry grade robots to create a truly engaging audience experience in collaboration with Xpion, tree10 and IBG. Each robot is armed with an 98-inch 4K display and there are three 12,000 lumen projectors creating the backdrop. As you can see it is creating quite an impression. 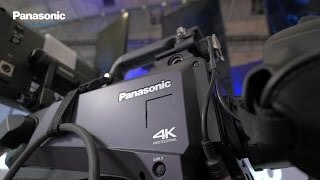 Panasonic was showing a stunning setup incl. 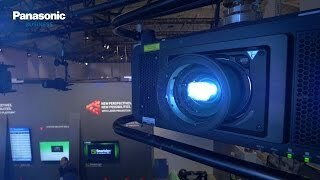 4K screens and 3-Chip DLP projectors at ISE 2016 in collaboration with Xpion, tree10 and IBG. The set includes three TH-98LQ70 which are robust enough to cope with the robots movement thanks to their aluminium back frame design. DS12K projectors integrated into the stage floor illuminate the stage backdrop, without casting shadows thanks to the LE90 ultra short throw lens technology. 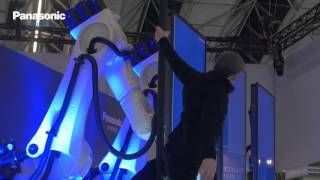 Robot applications, like this are becoming more accessible for every event, thanks to companies like XPION and its RobEX package.